Ok, so maybe this robotic chick won’t last a lifetime, but its lifespan does depend on battery life and your ability to avoid treading on it, crushing its poor unsuspecting back and leaving it for dead (well not quite, but you get the drift). You’d expect to see this kind of thing around the Easter period, but like a newborn pup, a chick is for life and not just to keep you content around the appropriate season. While owning an ordinary chick is probably frowned upon by the RSPCC, they couldn’t care less if you have a robotic one. 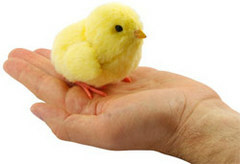 It even chirps like a real chick and flaps its little wings – how cute and adorable does that sound? I can’t imagine a chick is the most popular and coveted household pet (robotic or otherwise) unless you’re still yearning for the opportunity to own your own since watching Friends. But if you’re staring adoringly at your screen right now, you can get one from ThinkGeek for $30 USD. We’ve already seen a robotic hamster. Personally, I’m waiting for a robotic monkey? A bit of the wrong time for Easter related gags isn’t it lol? Actually looks like a pretty cool toy though!